A U.S. Model 1842 Percussion Martial Pistol by Aston: The 8 1/2", 54 caliber barrel marked U.S./JH/P. Tang dated 1851. Lock with standard markings and dated 1852. Brass furniture. Walnut stock with two inspector's cartouches. Many thanks to "CW SLAGE ANTIQUES" for the photos. IN 50 CALIBER PERCUSSION (CAP & BALL)PISTOL. H. ASTON & CO. PISTOL. Made in Middleton, CT. from 1846 until 1852. 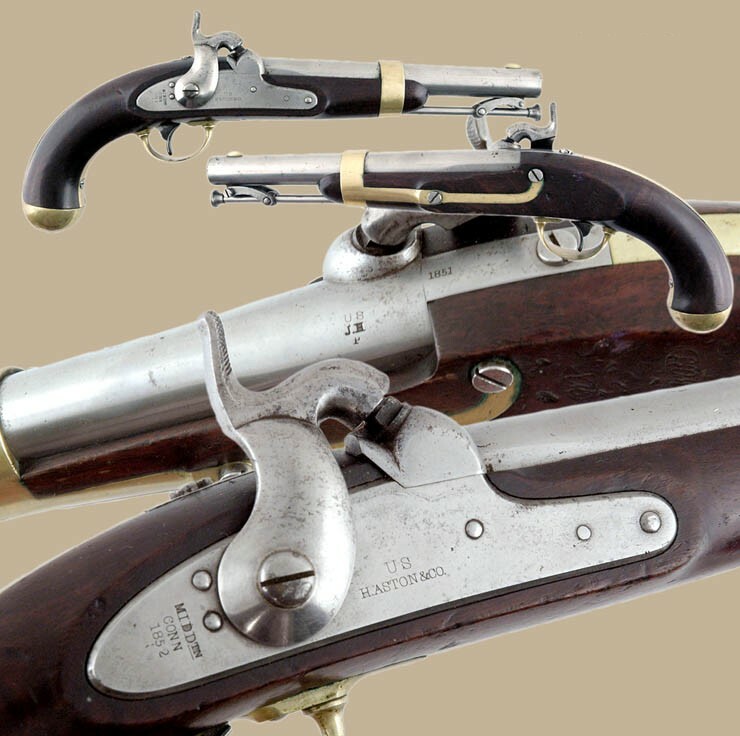 The U.S. War Department ordered 30,000 0f these pistols in February of 1845 for the Army and Navy. Overall length 14". Barrel length 8 1/2 ". Caliber .54. MARKINGS: US H. AsTON & Co. just forward of the base of the trigger. MIDDTN CONN 1851 is found just behind the trigger base.